Born at Pembury in Kent in 1825, Henry was brought up by his relatives after his father, Samuel Hickmott, was arrested and transported to Australia in 1840. Henry married Sophia Goldsmith at Hackney in Middlesex on 18 June 1848. In May the following year, the young couple and their two daughters, Emma and Eliza, emigrated to South Australia on the sailing ship EMILY. Click here to read more about their life and times in England's newest colony. Sophia died in 1853 and Henry married Harriet Waters. 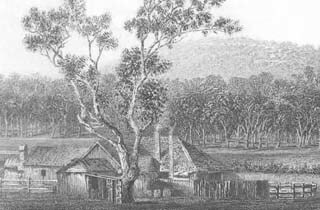 In 1855 he travelled overland from Mount Barker to the Victorian gold fields. He seems to have done well, returning to South Australia and bringing his family back to Melbourne by sea. After a brief stay in the capital they moved first to Clunes and, in 1872, onto land at West Charlton in Victoria's Wimmera district. Harriet died at Charlton in 1877 and Henry again remarried, to Margaret Kaye at Wooroonook in 1879. Towards the end of his life, Henry lived at Rochester with his son Joseph. He died there in 1914 and is buried in the Panoo Bamawm cemetery at Pine Grove. Click here to read about Henry's life and times in Victoria. 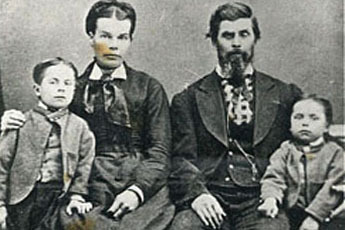 In addition to having a long and eventful life, Henry (pictured on the left with his second wife Harriet and their two youngest boys, Richard and Joseph) had numerous children many of whom subsequently had large families. All together Henry fathered sixteen children we know of: four with his first wife Sophia Goldsmith, eleven with Harriet Waters and one with Margaret Kaye (nee Sartain). These in turn provided him with 36 grandsons, 35 granddaughters and innumerable great grandchildren. Henry's line of the Hickmotts has certainly kept the name alive in Australia. It has also facilitated the spread of the Hickmott name well beyond the Charlton district of Victoria and into almost every state of Australia.